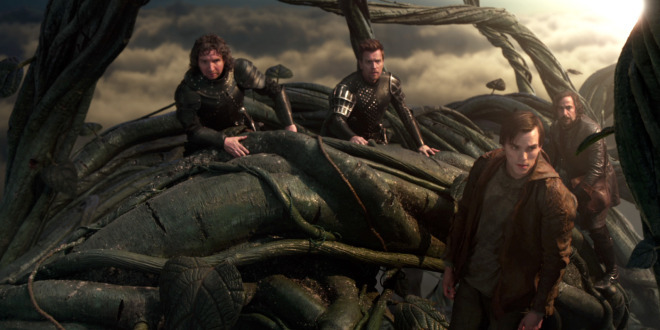 From left to right: Eddie Marsan, Ewan McGregor, Nicholas Hoult, and Stanley Tucci get their adventure on in ‘Jack the Giant-Slayer’. At first blush, Jack the Giant Slayer would appear to be nothing more but the latest in what’s becoming a long and lackluster line of hipster re-imaginings of classic fairy tales; in truth, it’s something those films have failed to be: entertaining. Where Snow White and the Huntsman and Hansel & Gretel: Witch Hunters were content to coast on Twilight-esque tortured romance and crude tongue-in-cheek genre mash-up, respectively, director Bryan Singer (Valkyrie, the forthcoming X-Men: Days of Future Past) and his cadre of screenwriters (which includes Christopher McQuarrie) wisely keep their tale simple and old-fashioned. Singer and company waste no time in getting the story going and keeping it rolling briskly through a 115-minute running time, quickly setting the stage with a flashback that sets up the story (via an animated sequence that unfortunately looks like an intro from a ’90s-era CD-ROM fantasy game) of an idyllic kingdom and the race of banished giants who would love to crush it. Anyone who heard the classic fairy tale as a child knows the basics: A hapless young farmer, Jack (Nicholas Hoult, Warm Bodies) acquires some magic beans which sprout into a towering beanstalk, climbs the aforementioned vine, rescues a damsel (in this case, a headstrong princess played by Eleanor Tomlinson), slays a giant or two, and lives happily ever after. The details are elaborated upon and tweaked a bit to give this version an epic feel, but the key elements remain unchanged: Princess Isabelle is in a pre-arranged engagement to conniving nobleman Roderick (Stanley Tucci) who, of course, covets the throne. A chain of events culminates in Isabelle propelled skyward upon a beanstalk. Jack joins the rescue party let by captain-of-the-guard Sir Elmont (Ewan McGregor) which finds itself in the land of some very disgruntled giants. Bill Nighy and John Kassir provide the voices for two-headed giant Fallon. 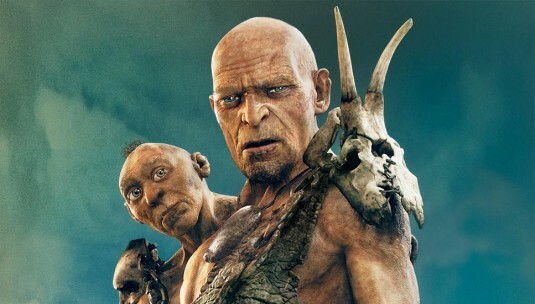 They’re a suitably nasty bunch, in every sense of the word, led by two-headed Fallon (played primarily by Bill Nighy, with the smaller and less articulate head voiced by the former Crypt Keeper himself, John Kassir), and the CGI work involved is largely pretty impressive. There’s an impressive — and much-appreciated — economy of storytelling on display; Singer’s only goal is to show us a good time, and does so quite well, zipping us from point A to point B with flair and without pretension or self-indulgence. He’s worked on this scale before, and his approach plays like Peter Jackson without the excess. Truth be told, in some ways Jack trumps The Hobbit, especially during the ubiquitous final battle that centers around a brutal castle siege. However, Singer’s fantasy world is a bit generic in look and feel, and its inhabitants are painted in broad strokes: The heroes are suitably heroic and the bad guys are an exercise in scene-chewing evil — especially Tucci, who borrows liberally from the Princess Bride school of medieval villainy (that’s good thing). Hoult and Tomlinson are a safe, by-the-book screen couple, yet that are far more engaging and endearing than Kristen Stewart and Chris Hemsworth proved to be. McGregor channels his inner Errol Flynn as the swashbuckling Elmont, with a snazzy haircut to boot. McShane is usually more fun when he’s being bad, but he plays rat bastards and scumbags so often that it’s refreshing to see him cast as a stern but patient father figure. All in all, for a movie about men vs. giants in a box office arena where size usually does manner, Jack the Giant Slayer holds its own quite well. I’m shallow, I admit it. I’ll be seeing this just for Ewan McGregor.